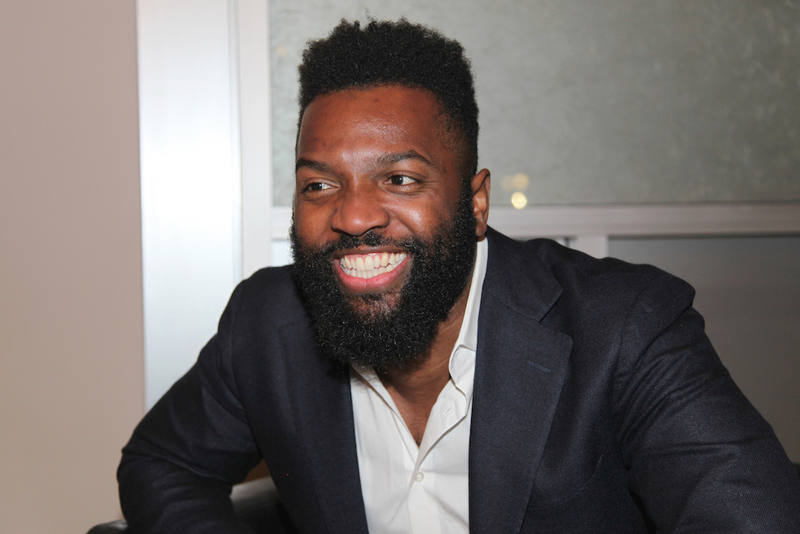 Baratunde Thurston is a cultural critic, comedian, host of the podcast Spit, and the author of How to Be Black. Before moderating a Smithsonian/ASU “What It Means to Be American” event titled “What Does the Life of Frederick Douglass Tell Us About America?” at the National Center for the Preservation of Democracy in downtown Los Angeles, he spoke in the green room about reluctant messiahs, the timelessness of the Jackson 5’s music, and his grade-school teacher’s great expectations. My first-grade teacher in Washington, D.C. was Ms. Purnell. And then actually for second and third grades I had the same teacher, Ms. Murray. Ms. Purnell, I think, in part, she was the first proper teacher. First grade is a big deal, you got desks, big upgrade! Ms. Murray, though, she was very maternal; she was stern yet loving. We had her for both years, so she kind of carried through from year to the other. And she pushed us. I think she believed that we could do the things that were expected of us. I went to a D.C. public school—this is in the early 1980s—there weren’t always great expectations of me and my peers. And she maintained them. And my high school English teacher, Ms. Berry, she encouraged me to take a philosophy class when I went to college. And I did, and I ended up majoring in it. And that severely affected my brain and how I see the world. Why’d you decide to be a philosophy major? It was fun! I went to college thinking, “I’m going to be a math major. I’m going to do computer science.” That was kind of drilled into my head. I was good at it, and I like to do things I’m good at. And I thought I was on the path to becoming a computer engineer, a mechanical engineer, an electrical engineer, it didn’t matter. So I took a history class, computer science, math, and philosophy. And I stuck with philosophy because I had fun with my classmates, arguing and discovering together what this text might mean. I enjoyed writing philosophy papers more than any other papers. And it turns out I was pretty good at it. So, it checked a lot of boxes. Which pieces of music, artworks, poems, or books do you regularly revisit? For years, I used to read a book every spring, Illusions: The Adventures of a Reluctant Messiah, by Richard Bach. Someone in college gave it to me one year, so maybe five, six years straight I read it every year. What turned you on about that book so much? It was short! I had a full load of classes, I had a lot of extracurriculars, I also had a job on campus. And I was curious and voraciously consuming information; I still have a podcast in one ear at all times. It was a story; it wasn’t a series of principled points. It had a counter-narrative of like, “Oh, you’re the messiah and you don’t want this job?” The messiah is a tough job, and I liked the idea of a messiah who’s trying to get rid of this—“I don’t want people looking at me to heal them, I don’t want to get burned again.” We have an assumption of envy around that job, and it turns out it’s a job. It humanized the idea of a messiah by making it a job and a burden, which it probably seems like to people who seem messianic. What’s one of your happy childhood memories? Bike-riding through Rock Creek Park. I had a childhood that on paper, and in actuality, had some traumas associated with it. My father was murdered; my mom hustled; and we got really lucky; and she worked very hard; and I worked very hard; and a lot of people helped us—like those teachers. But I didn’t feel in the moment under siege, in part because of Rock Creek Park. And I was walking-distance from it. I lived on a street called Newton. And there was a hill, Snake Hill, this winding hill, and we would go down it—“Can’t use your brakes!”—on skateboards or bikes, and it dumped you right down onto Rock Creek Parkway. And from there you could get to the world. You could bike to the zoo, you could bike to Rockville [Maryland], which was like a whole world away for a 10-year-old. And the creek was just beautiful. So I had access to nature and the outdoors. There was a lot of happiness in that park on my bike—with my sister, with my friends, even sometimes with my mother.